IntroductionAt the present time, modern civilization is largely dependent on oil and its by-products. Vast quantities of liquid products are transported by tankers throughout the world, as such concern for the environment associated with tanker traffic has become number one priority in the anti-pollution campaign. Given the fact that oil tankers have been involved in a number of damaging and high-profile oil spills which costs millions of dollars, they are subject to stringent design and operational regulations under IMO. IMO is a specialized agency of the United Nations. It is the international statutory body responsible for measures to improve the safety and security of international shipping and to prevent marine pollution from ships through International Conventions, advisory bodies and education. The International Conventions are the foundation for most international and national legislation regarding the construction, operation and manning of ships. When the conventions are adopted or ratified by national governments, they are embedded into national legislation, usually through a Maritime Act or similar legislative tool. It is therefore the responsibility of national governments worldwide to enforce the requirements of the Acts on ships sailing under their national flag of registry, or foreign ships operating within their jurisdictional waters. This enforcement is carried out by both the Flag State Control and the Port State Control. The International Conference on Marine Pollution: Convention for the Prevention of Pollution from Ships 1973 and the related 1978 Protocol (MARPOL) attempt to eliminate intentional pollution of the marine environment by oil and other harmful substances through setting mandatory regulations to control such activities worldwide (IMO 1997). While the establishment of shipping rules and standards has been subject to compromise among signatory nations and enforcement is difficult, MARPOL has been remarkably successful in its achievement of reducing oil pollution. It is estimated that operational discharges of oil dropped 85% between 1973 and 1990 (Griffin 1994). Major Structural Features of a Crude Oil TankerDesign defects of the shipÃÂs structure might cause serious oil spills. Among these, the one that arouses most public concern today is that of the single hull design (Michael & James 2006). In single hull tankers, the oil is separated from the seawater only by the bottom and side plating. In case of collision or grounding, when the hull is damaged, the risk that the cargo oil in the tanks be discharged into the sea and cause pollution to the environment is very high as compared to double hull designs which protect the cargo tank with a second inner plate at a sufficient distance from the outer shell. In 1992, as a result of the Exxon Valdez accident on 24 March 1989 (BBC 2008), regulation 13F in Annex I of MARPOL 73/78 was amended to make it mandatory for tankers of 5,000 dwt and more ordered after 6 July 1993 to be fitted with double hulls, or an alternative design approved by IMO (2002). Following the Erika incident off the coast of France in December 1999, IMO Member States discussed proposals for accelerating the phase-out of single hull tankers. A double hull tanker can be defined as a ship designed for the carriage of oil in bulk where the cargo spaces are protected from the environment by a double hull consisting of double side and double bottom spaces dedicated to the carriage of ballast water (AMSA 2005). Modern tankers are built with a second hull & double bottom tanks below the cargo tanks that gives protection against pollution should the shipÃÂs hull be damaged. Piping systems in double hull tankers can also be fully segregated with cargo pipes able to be run almost exclusively through cargo tanks and ballast pipes through ballast tanks. This overcomes the problem with single hull tankers whereby a leakage ballast pipe run through cargo tank can sometimes become a potential source of pollution by contaminating the clean water ballast. It is acknowledged that double hull vessels have some advantage over single hull vessels, providing added security in low impact collisions and groundings, but without high quality operation, maintenance, classification surveys and proper policing by flag state & port state, theyÃÂre susceptible to more problems (OCIMF 2003). There are two major sources of operational discharges: oil contaminated ballast water and cargo tank washings. When tankers offload cargo and prepare to travel empty, they must take on large quantities of ballast water to maintain proper balance of the ship at sea. Historically, tankers would store much of this ballast water in empty cargo tanks. Because these tanks contained oily residues, the ballast water became contaminated. It is often estimated that the amount of oil released into oceans by tanker vessels as a result of operational discharges greatly exceeds the amount released during accidental spills (Shaw et al. 1987). 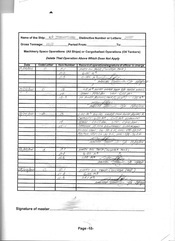 The 1978 MARPOL Protocol introduced the concept known as protective location of Segregated Ballast Tanks (SBTs), tanks that are designated for ballast water only. This means that the ballast tanks (which are empty on the cargo-carrying leg of the voyage and only loaded with water ballast for the return leg) are positioned where the impact of a collision or grounding is likely to be greatest. In this way the amount of cargo spilled after such an accident will be greatly reduced. The integrity of protective coatings and cathodic protection in ballast tanks in particular must also be maintained to prevent potential leakage, pollution and sometimes fire. The 1983 MARPOL amendments ban the carriage of oil in the forepeak tank - the ship's most vulnerable point in the event of a collision. Shipboard Cargo Handling EquipmentIn ensuring efficient, accident-free operation of the basic cargo handling system, knowing the minimum length of cargo pipes & the types of pipeline systems in relation to the type of cargo pump used, together with the various types of valves & spool pieces that regulate & control the liquid product are crucial. Different types of pipeline systems exist for cargo operations on crude and product tankers. The principal problem faced by designer in laying out a piping system is flexibility and costs. Obviously the best and safest system is one incorporating one line, one deepwell pump and one manifold port & starboard for each tank. However, on a vessel with as many as 20-30 tanks, problems of cost and space make this type of layout costly. One way around the problem is to use one pump in each tank and on the main deck, combine a group of tanks to a common line and manifold with the necessary closing valves fitted on the main deck to isolate the main line from the branch lines. Another solution would be the incorporation of pump rooms, usually centralized at the aft of the vessel along the common line, but they carry the risks of valuable cargo loss & difficulty in cleaning. The advantages and disadvantages of the different types of pipeline systems must be known in order to carry out safe loading and discharging operations (Dhananjay 2006, p. 135). In the oil trades, the most common piping systems are ring main and block. The advantage of ring main is versatile ÃÂ any pump can be configured to discharge any tank with good segregation. However the disadvantage is the poor flow rate due to the restriction imposed by the large number of bends and joints, which is also expensive both in construction and maintenance. The main advantage of the block system is a very high rate of discharge is possible with few pipelines and limited losses to friction, but the disadvantage is that overflows are possible if the cargo levels in all tanks are not carefully monitored. To prevent over pressurisation or under pressurisation and to allow for the normal expansion and contraction of oil, Pressure Vacuum Valves (P/V valves) are fitted on individual tanks or on individual mast risers connected to tanks. In case of an increase in pressure, the pressure disc lifts venting inert gas and in case of under pressurisation, the vacuum disc lifts allowing outside air to break the vacuum but if connected to external inert gas system such as nitrogen cylinders, it allows inert gas to displace the atmosphere and balance the pressure to protect the tank & cargo. Should the tank be isolated from the main inert gas system, this valve is an independent fail safe system. Suitable methods of cargo control during loading & discharging operations are essential for the safety of the vessel and should take into consideration the proper usage of cargo pumps & valves depending on the type of cargo carried & pipeline systems onboard. Incorrect operation of pumps & valves can produce pressure surges in a pipeline system (IAPH et al. 1988). The most common type of cargo valves used is Gate Valves and Ball Valves. Gates valves are either remotely or manually controlled to effectively seal off the flow of oil but it canÃÂt be used to regulate such flow because of its design in wedge shaped. Manual Gate Valves are placed in check valve sections from time to time in order to ensure more positive isolation than check valves can provide (check valves are designed to operate one-way and stop product from reversing flow). Ball valves operate by means of a sphere rotating 90 degrees between open and close status, through which there is a circular space the same diameter as the pipe. It is used for regulate & throttling services and according to IAPH et al. (1988), valves which control liquid flow should be close slowly. The advantage of using ball valves is that they durable, capable of withstanding high pressure. TheyÃÂre also economical in space and cheaper than gate valves, however the disadvantage is it depends on pressure on one side of the ball to make the positive seal on the other side. Problem can arise during discharge when trying to maintain segregated products from tanks sharing a common pump, one solution is to use a hydraulic or pneumatic portable pump, lowered into the tank to discharge the cargo ashore, thus avoiding contaminating any of the vesselÃÂs lines. As explained earlier, the best solution is to use deepwell pump dedicated in each tank for high speed & efficiency to strip empty the tank, especially for oil product which has high viscosity. For pump room system, centrifugal pumps are used. This type of pump uses a rotating impeller to force the liquid through the pump chamber, accelerating by centrifugal force outwards through the discharge line. A disadvantage of this type of pump is its inability to exhaust any gas which builds up in the inlet section of the pump chamber, resulting in loss of efficiency. To avoid accidents, when using pump room system, ship crews have to pay careful attention to ensure that the relevant valves along the pipe lines connecting the tanks to the pumps are open before any load & discharge operations. Operational Practices to Prevent Accidents and PollutionFor ship owners and operators, operating safely, securely, and pollution-free is a subject with particularly serious implications. First, preventing accident means protecting crew members from personal injury. Second, accident prevention means protecting the environment from the consequences of any cargo spill. Without a clear understanding of using appropriate tools & equipments onboard a vessel, follow by correct & proper operating procedures, one cannot eliminate & prevent accident and pollution from happening. Due to the nature of oil being a flammable product, to prevent the vapour space of the oil tanks in the vessel from catching fire & explode, an inert gas system that is designed and operated to maintain the atmosphere of the cargo tanks non-flammable is required onboard modern vessel. According to Eyres (2007), inert gas maybe produced by the main or auxiliary boilers which use flue gas that typically contains 2 to 4 percent of oxygen and is scrubbed with sea water to cool it & remove sulphur dioxide and particulates. Alternatively, inert gas can also be produced with a generating plant onboard that burn diesel or light fuel oil & is scrubbed and used in the same way as boiler flue gas. Hydrocarbon gas normally encountered in oil tanks cannot burn in an atmosphere containing less than 11 percent of oxygen by volume. Inert gas introduced into the tank will reduce the air (oxygen) content to prevent combustion. To further deal with emergency & be prepared, the International Convention for the Safety of Life at Sea (SOLAS 1974), as amended, requires that the inert gas system be able to connect to an external supply of inert gas should the main system onboard fail to generate inert gas for critical operation. Inert gas is also used to purge down the hydrocarbon vapours in the cargo tanks to less than 2 percent after discharge so that gas-freeing may take place at the cargo tank deck level, or used prior to loading operation to purge down the oxygen level in the cargo tanks. Under the 1992 amendments to MARPOL, vessels may discharge cargo tank washings containing oil, also known as ÃÂslopsÃÂ into the ocean at a rate of 30 liters per nautical mile (16 liters per km), as long as they are greater than 80 km from shore. However, evidence has shown that it is common practice for vessels to exceed this limit (Gade & Alpers 1999, Lu et al. 2000, Lock & Deneault 2000). In order to further control such activities, ships have practice to keep these ÃÂslopsÃÂ in slop tanks onboard to be discharge at a reception facility at the next port of call. And by using Crude Oil Washing (COW), a procedure that is conducted during discharge that uses a high-pressure jet of crude oil from fixed tank cleaning equipment to remove the crude oil cargo itself at pressure of 9-10 kg/cm2, it will maximize cargo out turn and greatly reduce the amount of crude oil residues & slops left in the tank. For safety reasons, only tanker with an inert gas system and approved fixed washing equipment can use crude oil as a washing medium (Dhananjay 2006, p. 157). Safe practises require continuous drills, vigilance & commitment to safety. Achieving accident-free performance requires relentless focus on communication and training. Through constant emphasizing of safety communication, fleet seminars, continuous onboard training in fire fighting and emergency response with the right tools & techniques, crew members are better equipped to deal with unforeseen circumstances. Integrated computer operations and communication systems must be able to link fleets to shore side staffs for any emergency & updating of information pertaining to cargo handling procedures. Rigorous reporting and measurement in all aspects of operations provide an in-depth understanding of the effectiveness of systems and practises. ÃÂNear missesÃÂ caused by unsafe acts are documented and analyzed to yield important data on accident avoidance. Feedbacks both at sea and ashore are gathered to analyze & improve safety on the ship/shore interface. Performance incentives have to be put in place to give safety procedures the highest priority among the ship staffs. Ship must be constantly audited for safety and environmental compliance on an ongoing basis by third parties safety specialists (former Master Mariners or Chief Engineers) to ensure that theyÃÂre seaworthy to meet the strictest requirements of national & international regulatory bodies such as Flag States, Classification Societies, Port States, IMO & U.S. Coast Guard. The structural reliability of these ships will be assessed considering global and local loads acting on the hull structure and should take into consideration the design life of the ship, residual strength of structure such as local stresses, corrosion and buckling, risk associated with loss of structural integrity due to possible human error in cargo operations and seamanship, effect of frequency and extent of surveys, inspections and maintenance processes on structural integrity (Aksu et al. 1992). Whilst it is easy to understand the responsibilities of the ship owner as the transporter, it is also important to emphasize the contribution of the cargo owners as the charterers of the ship, because they have an insurable interest to make sure that the cargo reaches its final destination safely. To do this, Charterers are selective over the ships they use and have in place a system of ship vetting (also known as ship screening). It is a complex quality and risk assessment process taking into consideration many factors affecting the tanker management and operational standards of the ship in question. Key factors to determine the acceptability of a ship normally includes the ship owner/operator performance assessment and rating, incidents and casualty history, ship inspections and condition assessment data, Port State inspection performance and history, oil terminal performance and feedback. Also, to aid the vesselÃÂs personnel, surveyor appointed by the Charterers who is familiar with handling the specific grade of product can undertake inspections on the shipÃÂs tank & line system for preparation & cleanliness to load the product, and to carry out the necessary tests and requirements. As marine oil pollution cannot be limited by the borders between countries, so many of the pollution problems cannot be tackled effectively without joint action by the Member States at the Community level (Michael & James 2006). Over the years, the oil and shipping industries have contributed not just in compliance but also lead the way in innovative techniques and systems on safe operation and protection of the environment, which complement the statutory requirements of national & international regulatory bodies by forming their own organizations to advise and educate on technical matters. These main international industry organizations are International Association of Independent Tanker Owners (INTERTANKO), International Association of Classification Societies (IACS), International Chamber of Shipping (ICS), International Petroleum Industry Environmental Conservation Association (IPIECA), International Association of Ports and Harbors (IAPH), International Tanker Owners Pollution Federation (ITOPF) and Oil Companies International Marine Forum (OCIMF). Examples of their effort is the International Safety Guide for Oil Tankers and Terminals (ISGOTT), jointly published by the ICS, IAPH & OCMIF to give guidance on the safe operation of oil tankers and terminals, and the databases that have been established by OCIMFÃÂs global Ship Inspection Report (SIRE) Programme for the assessment of ships. ConclusionWhile perfection may or may not be achievable despite best efforts and practises to avoid accident and pollution, the ship management company must constantly focus on safety and environmental protection in order to produce improvement essential to such success. Continuous improvement to raise standards to build more robust, durable and fit for purpose ships with regular inspections and maintenance of ships in service are essential to avoid accidents & prevent pollution. ReferencesAksu, S., Price, W.G. & Temarel, P. 1992, ÃÂLoad and Stress Distributions on Bulk Carriers and Tankers in Various Loading ConditionsÃÂ, Proceedings of the International Conference on Tankers and Bulk Carriers, London. Australian Maritime Safety Authority 2005, Discussion paper: Comparison of single and double hull tankers, http://www.amsa.gov.au/Publications/Comparison_of_single_and_double_hull_tankers.pdf, accessed 25 September 2008. BBC News 2008, On this day 24 March 1989: Exxon Valdez creates oil slick disaster, http://news.bbc.co.uk/onthisday/hi/dates/stories/march/24/newsid_4231000/4231971.stm, assessed 25 September 2008. Dhananjay, S. 2006, Cargo Notes, Seamanship International Ltd, United Kingdom. Eyres, D.J. 2007, Ship Construction, 6th edn, Butterworth-Heinemann. Gade, M. & Alpers, W. 1999, Using ERS-2 SAR images for routine observation of marine oil pollution in European coastal waters, The Science of the Total Environment, pp. 441-448. Griffin, A. 1994, MARPOL 73/78 and vessel pollution: A glass half full or half empty? Indiana Journal of Global Legal Studies. International Maritime Organization 1997, MARPOL 73/78 Consolidated Edition, London. International Maritime Organization 2002, Tanker safety ÃÂ preventing accident pollution,http://www.imo.org/Home.asp?topic_id=155, accessed 23 September 2008.
International Association of Ports and Harbors, International Chamber of Shipping & Oil Companies International Marine Forum. 1988, International Safety Guide for Oil Tankers & Terminals, 3rd edn, Witherby Marine Publishing. Lock, A.R. & Deneault, L. 2000, ÃÂAerial surveillance to detect illegally dumped oilÃÂ, Backscatter, pp. 12-20. Lu, J., Kwoh, L.K., Lim, H., Liew, S.C. & Bao, M. 2000, ÃÂMapping oil pollution from spaceÃÂ, Backscatter, pp. 23-26. Michael, G.F. & James, H. 2006, ÃÂPrevention and Compensation of Marine Pollution DamageÃÂ, Recent Developments in Europe, China and the US, pp. 1-24, Kluwer Law International, Netherlands. Oil Companies International Marine Forum 2003, Double Hull Tankers ÃÂ Are they the answer?, http://www.ocimf.com/view_document.cfm?id=412, accessed 20 September 2008. Shaw, B., Winslett, B. & Cross, F.B. 1987, The global environment: A proposal to eliminate marine oil pollution, National Resource Journal, p.157. WriteWork contributors. "Oil Pollution Prevention (Structural Features of Crude Oil Tanker, Cargo Handling Equipments, Operational Practices)" WriteWork.com. WriteWork.com, 25 October, 2009. Web. 18 Apr. 2019.